Aloo chaat (savory potato snack) is a popular street food item in North India. It is prepared by frying potatoes in oil and adding spices and with chutney. If you want to bring a quick variety of North-Indian street-food, try making this Aloo Chaat (Delhi Style) at home. 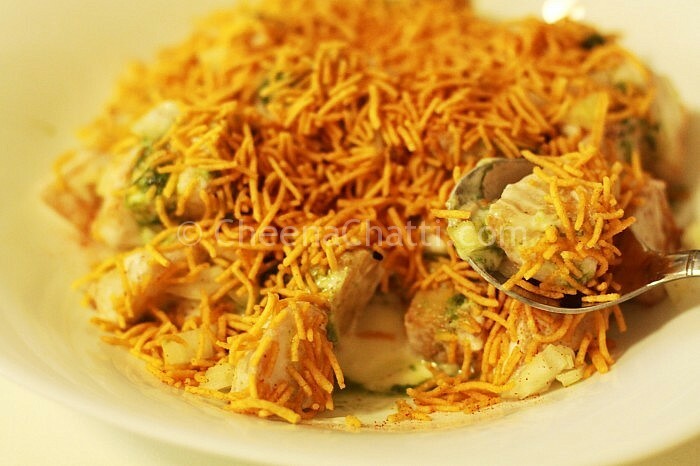 Add a mouth-watering and simple to make chaat dish in your list!!! Wash and peel the potatoes. Cut them into big-cubes. Heat cooking oil in a deep vessel. Deep-fry potato cubes until golden brown in color. Take them on an absorbent paper to drain excess oil. Transfer them to a serving plate. Pour strained yogurt (chilled) over it. Add all 3 chutneys onto it according to your taste. Garnish with aloo bhujiya over it and sprinkle a pinch of chat masala before serving! You can also try more potato recipes from our collection. How to make Spanish Potatoes / Bravas Potatoes / Patatas Bravas? How to make easy Aloo fry / Aloo roast / Potato fry? This entry was added on July 30th, 2013 by SJ in Vegan and tagged with recipe for aloo chat, best aloo chat recipe, vegetarian, streetfood, aloo chaat recipe, aloochat, delhi chaat. Last revised on March 27th, 2018. SJ, is aloo bhujiya is that golden color noodles like thing? Do we have to purchase it or can we make it at home?